Make entertaining easy with this quick pasta salad recipe! It's an easy way to sneak in an extra serving of veggies. 1. Cook pasta. Drain and rinse under cold water until noodles are cold and place in bowl. 2. Pour Ranch dressing over and coat noodles. 3. 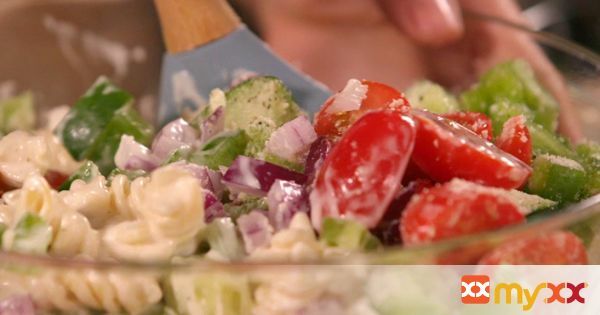 Chop pepper, red onion, cucumbers and tomatoes and add to bowl. Salt and Pepper to taste and top with Grated Parmesan Romano Cheese to your liking.